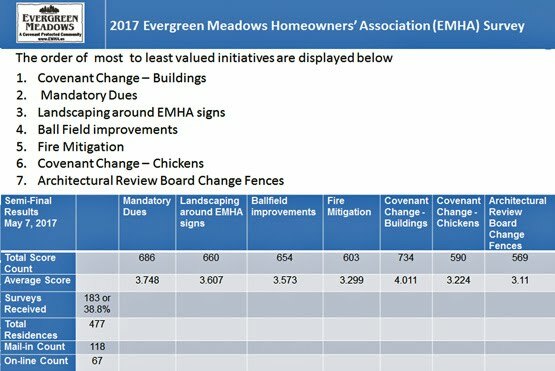 The Evergreen Fire Department has requested a change on the Evergreen Meadows Homeowners Association (EMHA) covenants. They have a 2 acre parcel at Highway 73 and Malamute that is deeded in their name but referred to in our covenants as an area that "shall" have a fire house. They wish to sell the property as they have no plans to build another firehouse after Station 3 was built only a few blocks away. So their request would require an EMHA covenant change. The board voted to study the implications such as legal or financial responsibilities. Before any covenant can be changed, 2/3 of the all owners, whether of not they pay dues- or approximately 315 owners - must approve any covenant change. Any change requires written agreement of the owners. Each residence is entitled to one vote. Regarding the EMHA survey, survey item decisions that include what and how anything will be deployed, will be decided over the next few months. A couple of the survey items, if chosen, would also require covenant changes. The survey results are below. Once the fire department proposal and survey item decisions are completed, we'll plan out how to apply any covenant impacts. Future information on this process will be sent out in emails via our News and Alerts Emailing list. You can register your email address at EMHA News and Alerts Mailing List . Updates will be posted on the EMHA website page - http://www.emha.us/survey2017 .